And Austrian great Marcel Hirscher effectively secured an eighth successive men's overall crown despite finishing only sixth in a giant slalom in Kranjska Gora, Slovenia, for a record-equalling 20th crystal. The 23-year-old Shiffrin led from the first run and had little difficulty seeing out the win in the Czech Republic in a combined 1 minute 38.98 seconds. It marked a triumphant return to the venue where she made her World Cup debut as a teenager in 2011 after finishing third in Friday's giant slalom. Swiss Olympic champion Wendy?Holdener was a distant 0.85 seconds behind in second while Petra Vlhova, who won the GS, was third but more than 2 seconds adrift. No skier, male or female, had previously won 15 races in a season - the previous record of 14 was set by the Swiss Vreni Schneider in 1988/89. 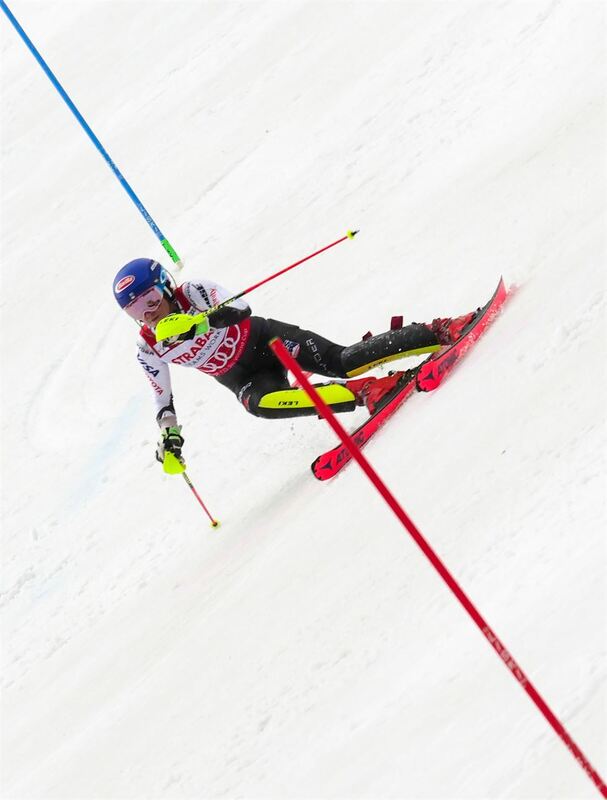 "I didn't want to defend anything today, rather take a risk in attack," said Shiffrin. Shiffrin has already secured a third straight overall title, the slalom discipline crown and is on the brink of first GS and super-g crystals, which she can clinch at the season finals in Andorra next week. The men's overall competition was settled in Hirscher's favour as he struggled a place below his final title opponent, Alexis Pinturault of France. Despite being the alpine combined world champion, Pinturault will not contest the downhill at the season-ending finals so cannot make up the 490-point gap to Hirscher in his four remaining races. "So far as I?can calculate, it is now all decided in the overall World Cup," Hirscher said in first television interviews. "What's amazing is eight overall World Cup wins, and all in a row. "That's a long time. That's really a performance, from the whole team that does it." Hirscher had already clinched the men's giant slalom and slalom discipline titles and has now matched Lindsey Vonn's record haul of 20 crystals, large and small, over his career. The race was won by Norwegian Henrik Kristoffersen by 0.24 seconds from compatriot Rasmus Windingstad, who celebrated his first podium place. Switzerland's Marco Odermatt took his first career podium in third, 0.56 seconds off the winner. It was Kristoferssen's first regular win this season though he beat?Hirscher to the world title last month. "This is now the reward for a lot of work," he said. "I have worked a lot on giant slalom in the last years. At the moment it's going really well in giant slalom."